Percy is learning to sit…but he’s not still for long! I started a blog way back in 2007 called “Princess of Patience.” It was more or less an online diary of sorts and I certainly never thought anyone would read it. Fast forward to 2009 and suddenly I had a book releasing and regular blog readers. Even so, I left the title as a reminder to myself that patience was one of those things I’d probably always need to work on. We had what can only be described as a tumultuous Christmas. Jessica, my stepdaughter, was in a horrific car accident on Christmas Day and since then, things have been a blur. She’s recovering now (Praise the Lord!) but has a long road ahead before she will walk again. Those long days after the accident while we lived at the hospital and had to sit in waiting rooms during her many surgeries weren’t easy. Once again, the need to be patient and just trust God was present in my life. There are certain moments when all you can do is wait patiently…and pray. We have certainly done a lot of that over the past month. 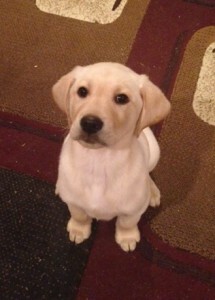 Two weeks ago, we brought home a yellow lab puppy—Percy. Working on crate training…but wishing he was outside playing! Let’s just say that Percy requires a lot of patience as well. Right now he wakes me up in the night every 3 hours or so to go outside…and I have to patiently wait out in the cold for him to do what he has to do. There’ s no hurrying him up…otherwise I may find myself cleaning up a mess later! And the mornings at 4 a.m. when he thinks his outside tasks should also include rolling around and finding sticks to bring me…well those mornings require a little more patience than others. I know many people have shared their “word of the year” over the past few weeks. Can you guess mine? This year I’m working on having more patience in all aspects of my life. My second word–is it even allowed to have two words?–is prayer. Patience and Prayer. That is what I’m focusing on in 2016. I didn’t make resolutions this year (first time in a long time!) but instead I’m going to try to live out my year prayerfully AND patiently. I’m happy to hear Jessica is recovering from the accident, Annalisa. As for Percy, what a cutie he is. No doubt, during his puppy years, your patience will be tested, but looking at that little face, it’ll be worth it. You are definitely allowed two words. We certainly all need to make prayer more of a priority–or maybe that’s just me. I find I talk to God all day, but don’t sit down and specifically pray for things. That is something I am also trying to change this year. Praying blessings on your family as Jessica continues to recover and you exhibit patience with little Percy. Labs are the best! I have two words this year too – Wait and Hope. I am praying for Jessica! I’m so glad to hear Jessica is improving. My patience for puppies is sorely lacking. Our son’s family lives across the yard and got a pup a few months ago. 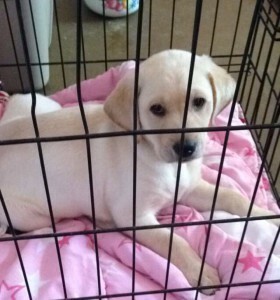 At least I am not in charge of crate training her! But she will drag around and chew on anything that is not tied down on the farm…and plenty of things that are. Sigh. Prayers for your daughter in law Jessica. We have a 6 year old black lab who is so adorable. Your puppy Percy will bring you so much love and joy. it does get much better but the puppy time is so hard on everyone. Our 6 year old lab will get ahold of pencils and chew on them. I have to remind my hubby to keep everything chewable out of reach since you never know when our dog Max will want to chew something. Hoping for a speedy recovery for Jessica and a better 2016 for all of you! Your puppy is so cute. I hope he learns quickly!! Praying for Jessica a speedy recovery and patience for you. So glad to hear Jessica is improving and I will continue to pray for her. Percy is adorable. I remember those days of puppy training well…and, at this stage, I’m glad they’re behind me. But dogs can be great companions and steal your heart. I completely agree with you regarding the patience issue. I used to have a sign in my kitchen that read, “Lord, grant me patience, but hurry!” That pretty much sums it up for me. Many blessings to you and your family in 2016! Thankful Jessica was okay, praying for a complete healing for her as she recovers. Percy is a cutie, but lots of work I bet :-) Your two words of the year sounds like they are perfect, may the Lord work both patience & prayer in your life! Seems like the two would go together…lol! !